Scleroderma is a poorly understood illness that causes widespread hardening of the skin, especially on the hands and face. It also can damage the lungs, heart, kidneys, digestive tract, muscles and joints. It is a long-lasting (chronic) autoimmune disorder, an illness in which the body's immune defenses mistakenly attack the body's own cells rather than protecting them from outside invaders. 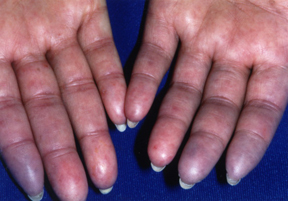 Scleroderma also is called progressive systemic sclerosis. There are two types of scleroderma. In the limited form, also called limited systemic sclerosis, the skin is the primary target. In the diffuse form (diffuse systemic sclerosis), the damage not only affects the skin, but also can affect the lungs, kidneys and other internal organs.